Sausage with peppers. A classic American-Italian dish. Fry some sausage. Add peppers and onions. A bit of garlic. Some dried oregano and basil. Pile it on a hoagie. Melt some cheese. That’s downtown. Roast sausage for colour. Sweat peppers and onion slowly until melting. Add white wine. Reduce. Now the tomato. Simmer. Add the browned sausage. Simmer a bit more to bring the flavours together. Serve on polenta enriched with butter, cream and fresh grated parmigiano-reggiano. Simple, clean tastes. That’s uptown. Internal temperature of the sausage is key. 150-160F is where the magic happens. Lower and the sausage is underdone. Higher and it starts to dry out. Nail it and it’s juicy and delicious. This is true no matter how you cook your sausage. Something to keep in mind next time you grill. The polenta makes a nice foil for this dish. The tang and richness of the cheese balances nicely against the acid of the tomato. It’s not essential but it’s a nice touch. You could also pile this on a hoagie with melted cheese. That’s midtown. 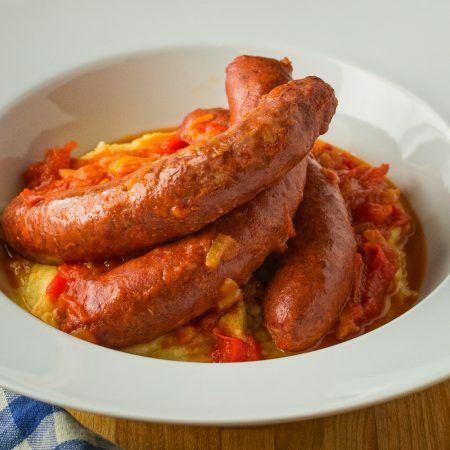 This upscale version of sausage with peppers focuses on clean flavours and simple ingredients. Thinly slice onions and red peppers. Heat olive oil in a pot large enough to hold all the ingredients. Add the onions and peppers and cook, over low heat for 3-4 minutes, stirring frequently. Cover and cook for 15-20 minutes, until onions and peppers and thoroughly softened. Add white wine. Boil to reduce to a syrupy glaze. Add tomatoes and simmer 15-20 minutes. Now is a good time to start to cook the polenta. Place sausages on a sheet pan and roast for 5-7 minutes turning once. Place sausage in the tomato red pepper mixture and simmer until the sausage reaches an internal temperature of 150-160F, around 10 minutes. Add the polenta to boiling stock slowly. Otherwise you will get lumps. Bring the chicken stock to a boil. Add the cornmeal slowly, stirring constantly. Slowly! You don't want lumps. Reduce heat to low and cook, stirring every few minutes, until the texture turns creamy. This takes around 30 minutes. Dig into the corners of the pot when you stir. Remove from heat. Mix in butter, cream and cheese. Serve quickly. Polenta waits for no-one. In italian, main course, meat, pork. Bookmark the permalink. 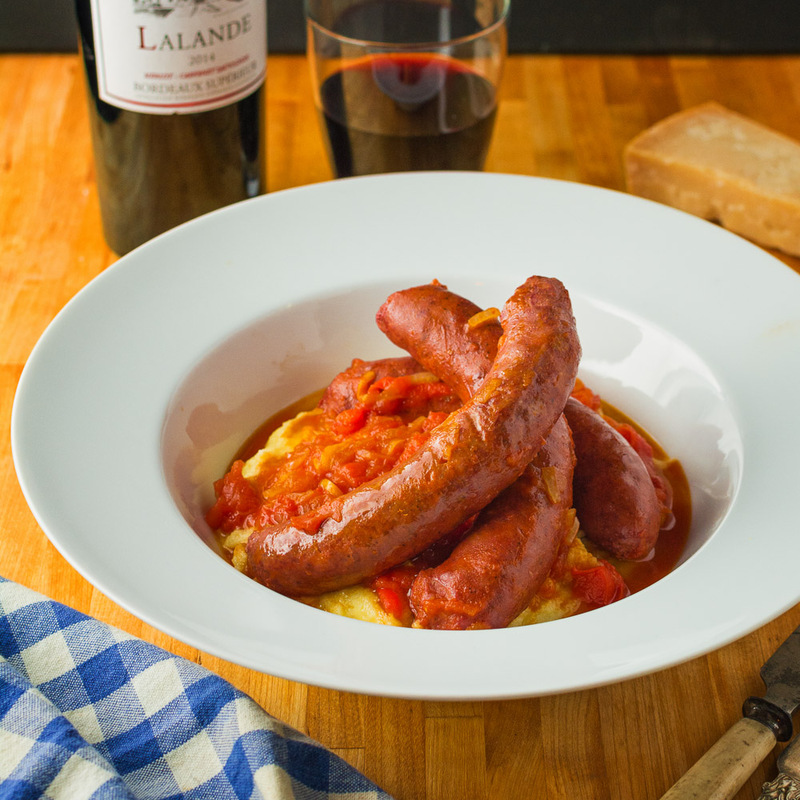 That creamy polenta sounds like it would balance some hot sausages perfectly. I make sausage and peppers a lot, but never with wine and tomato – I’ll have to try it because they look saucy and delicious! The polenta changes up the experience. The sausages are good on their own but the sauce and polenta together really adds another flavour combination I like. I didn’t know the ideal temp for sausage was 150-160, thanks for the awesome tip! I love the simplicity of this dish, can’t wait to try it out, thank you! I’m a big fan of my instant read thermometer. Food science is a good thing to keep an eye on for sure. Yum!! This recipe looks delicious! I’m a huge fan of peppers and sausage– such a classic combination. The polenta looks incredible too, but, sadly, I can’t have it right now because I’m lowering my dairy intake. Do you think I could serve the sausage with rice or pasta instead? What would you recommend? Thanks for sharing! I’m not a big rice lover so I can’t really comment on that but it would be awesome if you cut up the sausage and tossed the whole thing with some pasta. I hadn’t thought of that but I’m going to try that myself! This post makes me smile! Guess you can call me a downtown girl… David is going to love a sausage with peppers hoagie night! If it made you smile and you are going to try it I’d call that a home run! This recipe looks wonderful! Sausage with peppers is just a great combination and I have been meaning to make polenta again! I have always baked polenta, but I’ll try out your stovetop method next time! Thanks for sharing! Polenta done this way is great but you need to serve it immediately. It loses the creamy texture as it cools. My digital thermometer is my most prized tool in the kitchen. I’m so glad I found a fellow blogger who loves their thermometer as much as me. I don’t care what anyone says, it makes a difference. This recipe is right up my alley on dinners where I don’t have to babysit the stove and the wine is such a nice touch! BTW, have you ever been to the Sausage Kitchen up at Byward Market Square? I heard it closed down 🙁 but it was my fave place to go to whenever I was around the area! I’d go further and say unless you are a master chef you need to get into the habit of using an instant read thermometer. It’s basic food science. Internal temp is the only way to accurately know what you are doing. The higher the internal temperature, the lower the moisture content. Tell your non-believers to google it. Serious Eats. America’s Test Kitchen. Alton Brown. They can’t all be wrong. I miss the Sausage Kitchen. It was a foodie jewel in Ottawa for sure. Gorgeous pictures! This looks so delicious. I’ve been wanting to make polenta, and this looks like the perfect recipe to try! Riva, I hope you like it. Polenta is an often overlooked side that I’m trying to do more with. Not only do your recipes look delicious, your posts always have such valuable tips! Thanks Romain! Thank you. I do try to explain although I suspect I’m not always as clear as I should be.